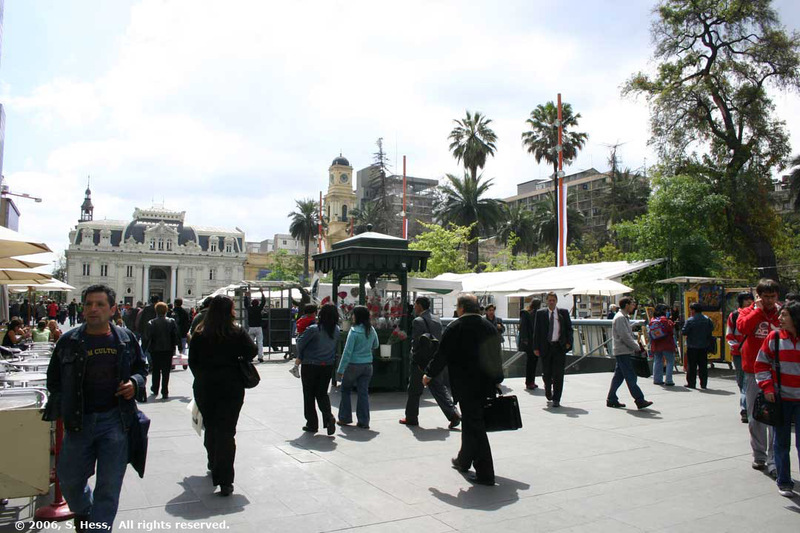 The hotel is a short walk to the end of Line One, which runs into the center of Santiago. The Santiago subway system is significantly smaller than the New York City system, much more modern and is still in the process of expanding. They need to expand the system because there is a great need to do something about getting some of the vehicles off the city streets. As an aside, they are also expanding the highway system to relieve the pressure on the main streets of the city. We took the subway to the La Moneda Station which is in the heart of the government offices in Santiago. La Moneda, the Presidential Palace, was built between 1788 and 1805 as the country's mint. 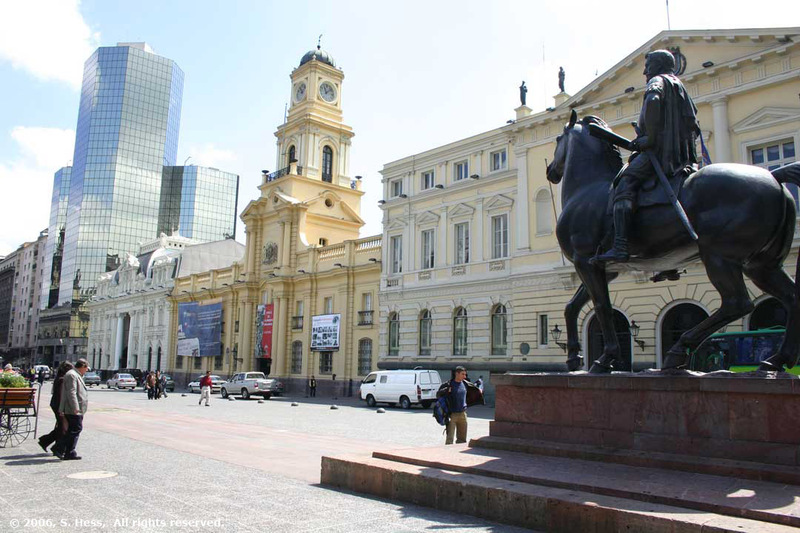 The presidents have lived at La Moneda since 1846 and shared it with the mint until 1958. It figured heavily in the coup that overthrew President Salvadore Allende in 1973 when it was attacked by the Air Force. This coup led to General Pinochet's rise to power. 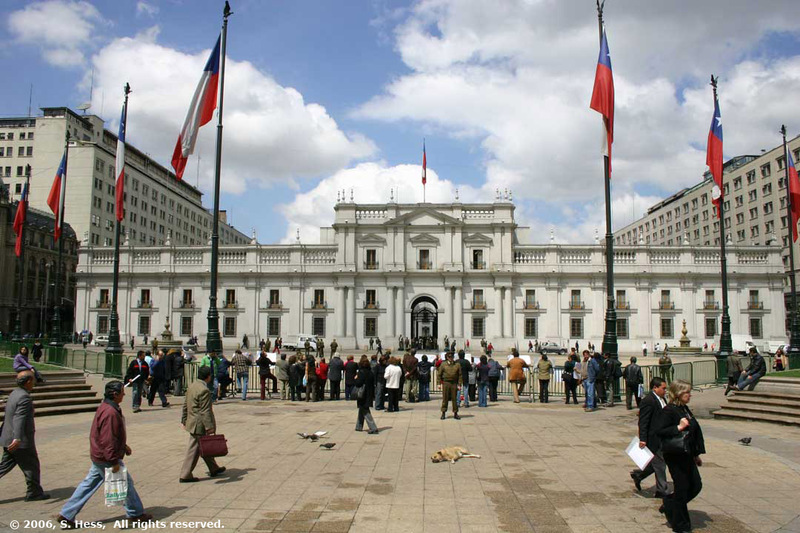 The interior of La Moneda was heavily damaged in the attack and the building was restored in 1981 and is now the seat of the government. 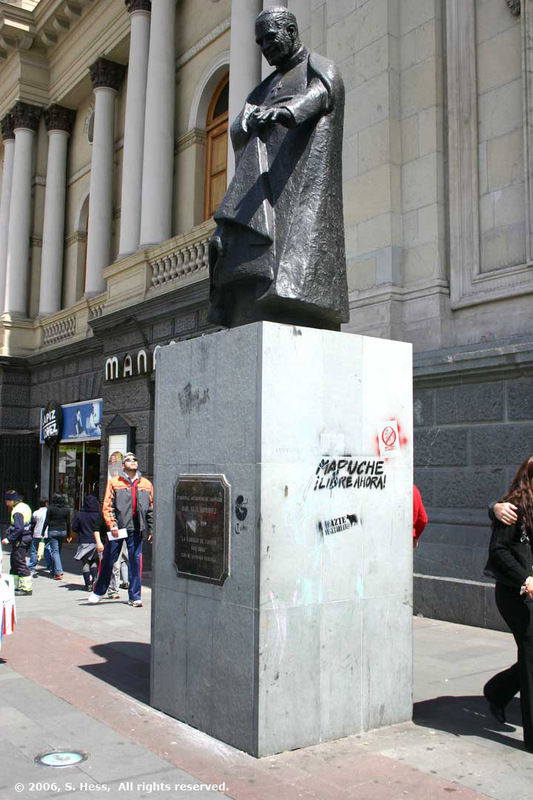 It is interesting that a statue of Allende, who was vilified during Pinochet's regime, stands next to La Moneda in the Plaza de la Constitucion. From La Moneda we meandered through the streets of the area (some are pedestrian malls) to the Plaza de Armas, which was the center of colonial Santiago when it was laid out in 1541. The plaza is bordered by several historic buildings including the Cathedral, Museo de Arte Segrado (Sacred Arts Museum), Museo Historico Nacional (it was the seat of the government in colonial times), Correo Central (Central Post Office), and Municipilidad (originally the colonial legislature and now the town hall). The Plaza itself is the center of many municipal events. This month is Senior Citizens Month in Chile (some might say that it is appropriate that we are in Chile this month) and the Plaza had booths displaying the works of many senior citizens groups. In the bandstand there was a group of seniors singing and dancing to regional folk music. We continued our walk past Cerro Santa Lucia, a hill that gives a good view of central Santiago. We chose not to walk up the hill (we did it on our last visit) as the haze would have limited our view. 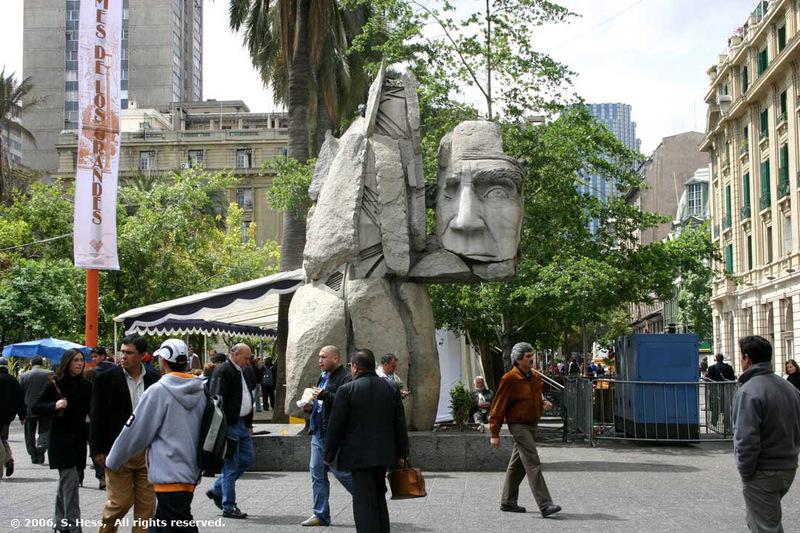 We continued to walk along the Avenida Libertador General Bernardo O'Higgins for some time eventually getting back into the subway for the ride to the hotel. In the evening we met with most of the family for a dinner out. Originally this was to be an adults only evening, but when we got to the restaurant, we found that some of the older children were there as well. This turned out to be an early evening by Chilean standards... we had dinner around nine and were back in the hotel reasonably early. La Moneda, above, as seen from the Plaza de la Constitucion. There were a few protesters and twice as many police to keep them under control. The one thing they don't control in Santiago are the feral dogs... they are everywhere as are their droppings. 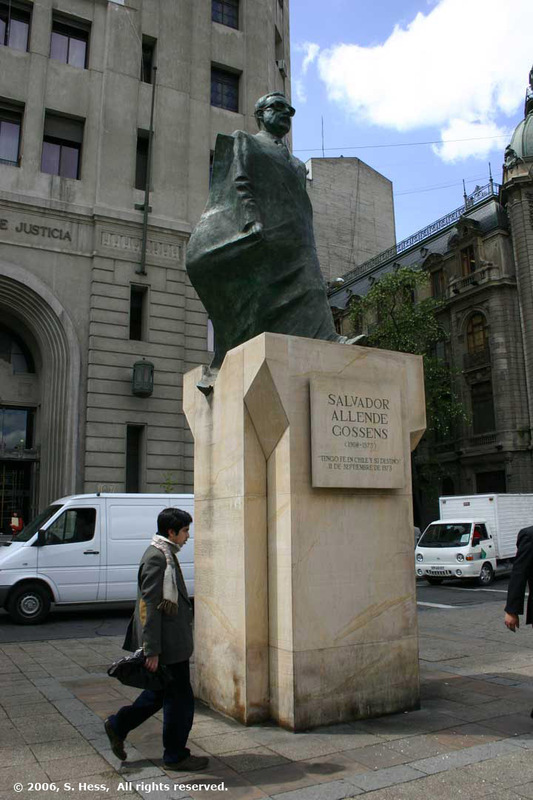 Salvadore Allende's statue is on the east side of the Plaza, ironically in front of the Justice Ministry. 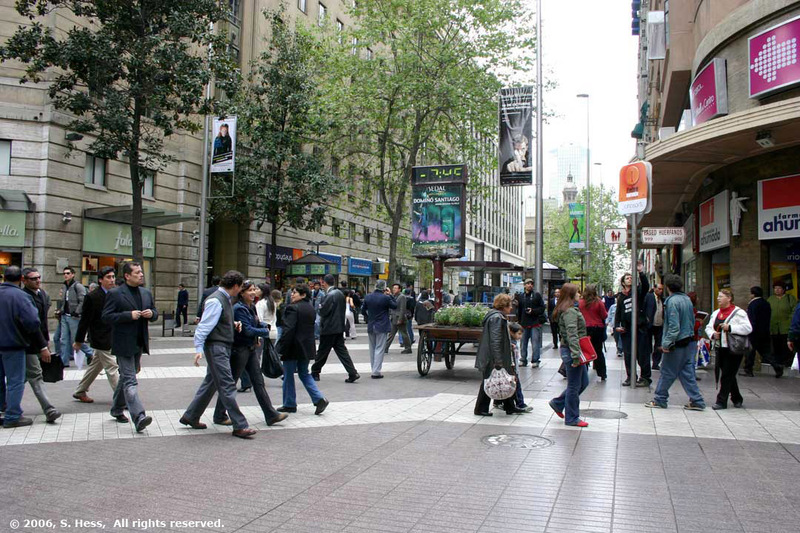 Central Santiago is a pedestrian friendly place. Sidewalks are wide, albeit occasionally obstructed by vendors and there are traffic free pedestrian malls with shops and booths. 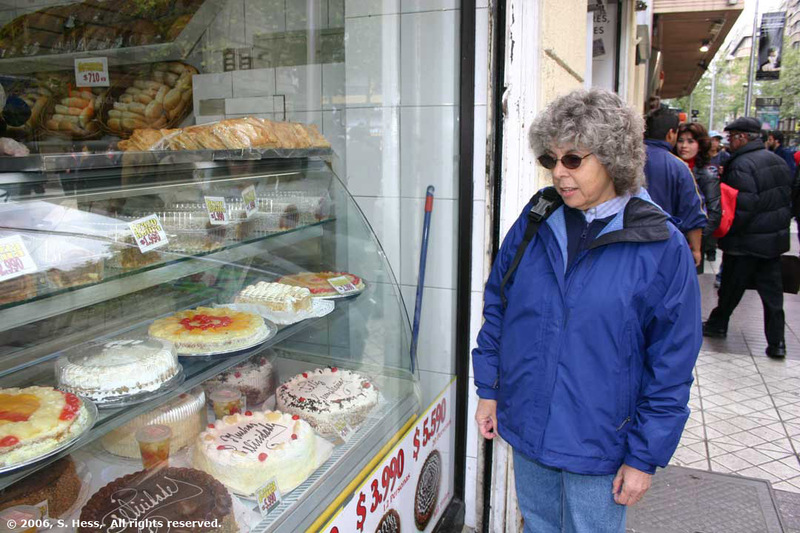 Susie is checking out a bakery on one of the pedestrian malls for cakes she would never eat. A group of seniors folk entertaining the crowd. The dog couldn't care less. North side of Plaza de Armas. From left to right, Correo Central, Museo Historico Nacional and Municipalidad. The statue is of Pedro de Valdivia, founder of Santiago. 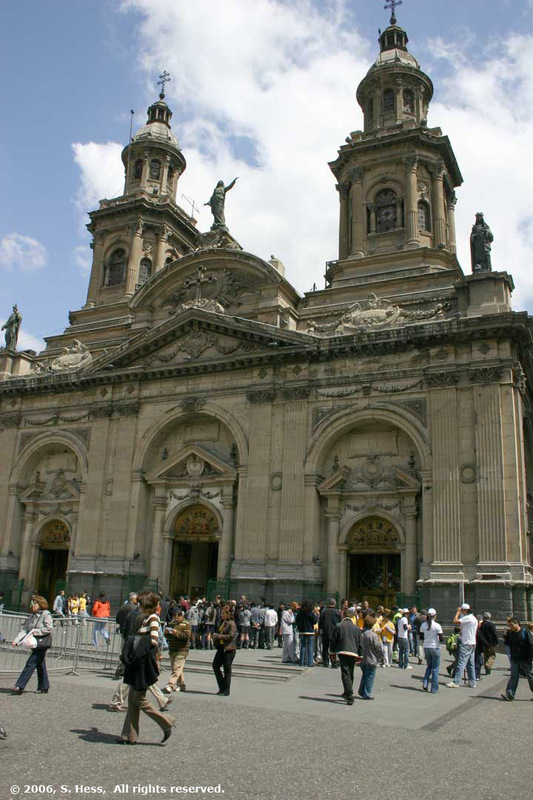 The Cathedral, left, is on the eastern side of the Plaza de Armas. It seems that every time I have been in Santiago someone was protesting something. Protest slogans are found painted everywhere. This particular slogan, on the base of a statue in honor of a Cardinal, says, Mapuche, Libre Ahora! (Mapuche, freedom now). 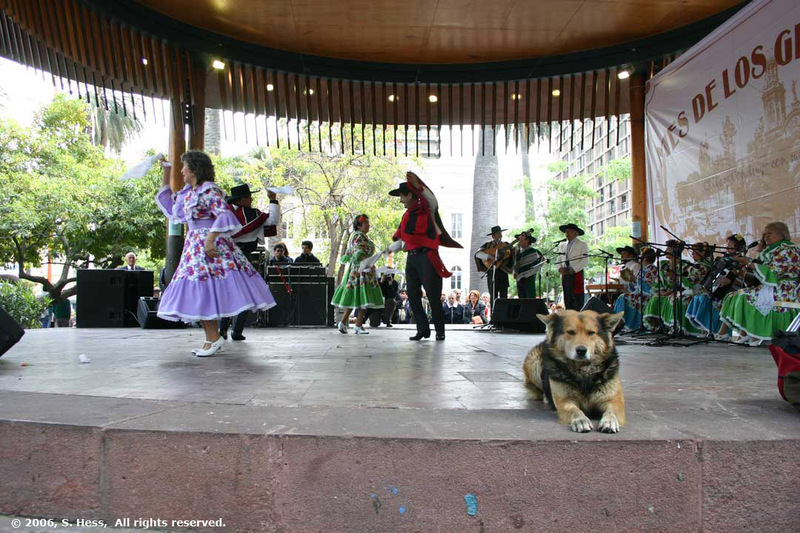 The Mapuche are a native people who have lived in south central Chile for thousands of years. They stopped the southern expansion of the Incas, were never subjugated by the Spanish and have never signed a treaty with the Chilean government. They have been seeking autonomy for generations.